Fiesole is a town and comune of the province of Florence in the Italian region of Tuscany, on a scenic height above Florence, 8 kilometres (5 mi) northeast of that city. 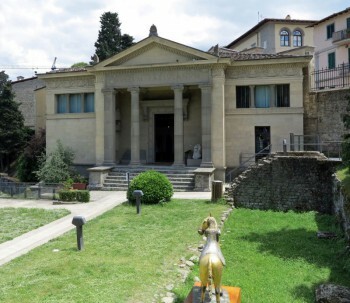 Fiesole (Etruscan Viesul, Viśl, Vipsul) was probably founded in the 9th-8th century BC, as it was an important member of the Etruscan confederacy, as may be seen from the remains of its ancient walls. The first recorded mention on the town dates to 283 BC, when the town, then known as Faesulae, was conquered by the Romans. In pagan antiquity it was the seat of a famous school of augurs, and every year twelve young men were sent thither from Rome to study the art of divination. 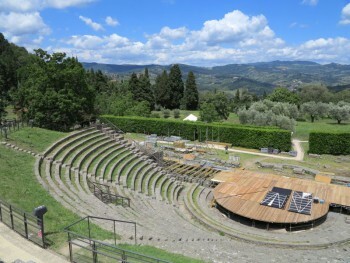 Sulla colonized it with veterans, who afterwards, under the leadership of Gaius Mallius, supported the cause of Catilina.Fiesole was the scene of Stilicho’s great victory over the Germanic hordes of the Vandals and Suebi under Radagaisus in 406. During the Gothic War (536-53) the town was several times besieged. In 539 Justinus, the Byzantine general, captured it and razed its fortifications. It was an independent town for several centuries in the early Middle Ages, no less powerful than Florence in the valley below, and many wars arose between them; in 1010 and 1025 Fiesole was sacked by the Florentines, before it was conquered by Florence in 1125, and its leading families obliged to take up their residence in Florence. Dante reflects this rivalry in his Divine Comedy by referring to “the beasts of Fiesole.” (Inferno XV.73). By the 14th century, rich Florentines had countryside villas in Fiesole, and one of them is the setting of the frame narrative of the Decameron. Boccaccio’s poem Il Ninfale fiesolano is a mythological account of the origins of the community. Robert Browning mentions “sober pleasant Fiesole” several times in his poem “Andrea Del Sarto”.